Almost two months ago, the loggers showed up and began our summer project of clearing what we hope turns out to be 15ish acres of new pasture for all of the critters. The plan was to go all the way up and down Mack Hill Road (about 1500 feet) and back about 600 feet. All of that is outside of the Conservation Easement that we gave to the Humane Society of the United States. 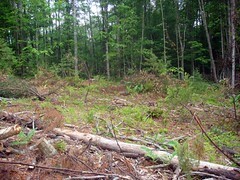 Originally, the plan had been to use the money from the timber to stump the land as it was cleared. But after two weeks, the guy gave us a bill for $3800 and we sent him packing. There’s no way to afford that, so we’re just going to have to live with the stumps. The land is so rocky and full of ledge that I’m hoping it really doesn’t matter. The stumps will rot eventually, and what sprouts from them will be eaten by the sheep in no time. They are browsers, and love to eat trees. The difficulty of not having that guy around to stump is that the plan was for him to take the small firewood trees and not charge of for that work, just take the firewood. He didn’t seem to get that, despite it being in the contract, and was charging us for the time to cut them down and haul them. So I’m not sure what we are going to do with all the trees that are left standing after the valuable pine and hardwood has all been taken. 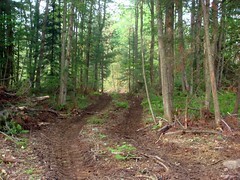 What it looks like right now is lots of new logging roads all through the area, leading to small areas of clearing. The clearings themselves are full of brush and debris from the trees that were removed. I think they plan to push all of that into brush piles, but for now, it is treacherous to walk in there, says the person with two bad knees. (Damn ACLs — I found out from the doctor last week that they are BOTH gone. Arg.) It would be fine to put the sheep in there — they could care less about “good footing”. But the horses need better footing than that, though they do pulverize an area pretty quickly. I just wouldn’t want them to only have that sort of ground to hang out on. There are tons of tree tops throughout the area, filled with valuable wood. We can pull fence posts out of those, plenty of firewood to last us years, wood for the evaporator for making maple syrup in the spring, and countless other uses. I’ve been wondering about inoculating some of the hardwood with mushroom spores of various flavors. It’s just going to take a lot of time and hard work to get to it all before it just rots. I wish I had the equipment to get some of the green tree tops into where the sheep are now — they’d love to eat those leaves. Even if this is as good as it gets, I think we’ll just fence the entire perimeter and let the critters in. There should be enough money from the timber to buy fencing, and though we won’t be able to divide it into one acre paddocks, which is the best solution, at least the sheep can browse through all of the forage that is in the wooded areas. I’ll continue to feed hay in different spots, which will seed it, and we’ll see what comes up. 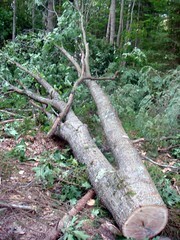 As we get time, we can clear out the smaller firewood trees. I’m even thinking of advertising locally for people to come get free firewood if they’ll just take it away. I’m not sure how else we’ll find the time to get it actually cleared. What I’d been hoping for were fields, you know, actual pasture, but I don’t think that’s going to happen. I may be wrong and shouldn’t be judging what the end product will look like, but I’m pretty discouraged right now, to be honest. I have such pasture envy! I mean, I bought a cow (more on her later when we bring her home), thinking we would have pasture to put her on. This entry was posted in Clearing, Pasture. Bookmark the permalink. Post a comment or leave a trackback: Trackback URL. OMG, Lisa. You must be so disappointed and probably pissed off too. Damn loggers. Sounds like they did a really bad job. I remember my ex husband doing a similar job. Creating pasture out of a forest. When he was done, except for the stumps, it was cleaned up and ready to use. He took some logs for timber, some for pulp, some for firewood, etc….sorting it as he logged it. He also piled the tops and brush for burning. I think the idea of letting people in there to take what they can use, is a good idea. With the price of fuel, you might get some response. Sounds like your other ideas will all work too. Local teens could probably go in there and gather tops and brush for burning or something…..maybe some boy scouts need something to do. Anyway, I sympathize. The logging industry is really corrupt and needs to be regulated. The majority of loggers are either thieves, or just half-assed. I hate to say that but I lived close to the industry for 10 years, and I learned too much I guess. Lisa, We have had timbering done also on our over 200 plus acres, and had it managed by a licensed forester. We didnt have clearing, but it was select hardwood cuts. We had them cut the tree tops into less than five foot high piles. We didnt need pasture so its a different situation. You have some great ideas. I admire what you do with your animals and all the work involved. One thing about letting people come in to cut firewood, be cautious as to the insurance subject, are you insured if someone gets hurt? Someone could possibly sue you. We let only people we know well to take firewood because of that, even though we are insured. I think you might need a bulldozer. uh – maybe post to local area mushroom growers to pick up and share some of their crops – fresh hardwood is very valuable to grow shitake – once inoculated, put in the proper place (near wet area but with some light to dry off ) – could take a couple years before they bloom … only tricky part, they have to be visited regularly as there is no telling when the shrooms start popping and when they pop they do go … on and on, year after year till the wood is gone ..